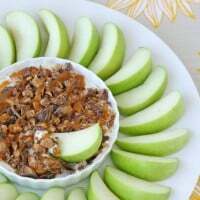 If you are looking to make “real” caramel apples, I have a full post on How to Make Gourmet Caramel Apples. I’ve seen quite a few variations on this cute cookie concept, including this post from The Decorated Cookie (who can make almost any food into a cute cookie!). Prepare red, “apple” green and “caramel” brown royal icing and thin to a medium/flood consistency (about the consistency of shampoo). Reserve some of the green icing before thinning, and add the thick icing to a piping bag fitted with a leaf tip (such as a Wilton #68). 1.) As pictured above, outline then flood (with the same icing) the portion of the cookie that looks like exposed apple. Allow this portion to set (about 1 hour). 2.) Fill in the bottom “caramel” portion of the apple with brown icing. While the “caramel” is still wet, sprinkle some seasonal sprinkles on the “caramel”. If the top portion of the cookie (the red or green) is still wet, be sure to not get sprinkles on that area. 3.) When the red or green “apple” portion of the cookie is dry or set, add the green leaf with thick icing and a leaf tip (as noted above). 4.) 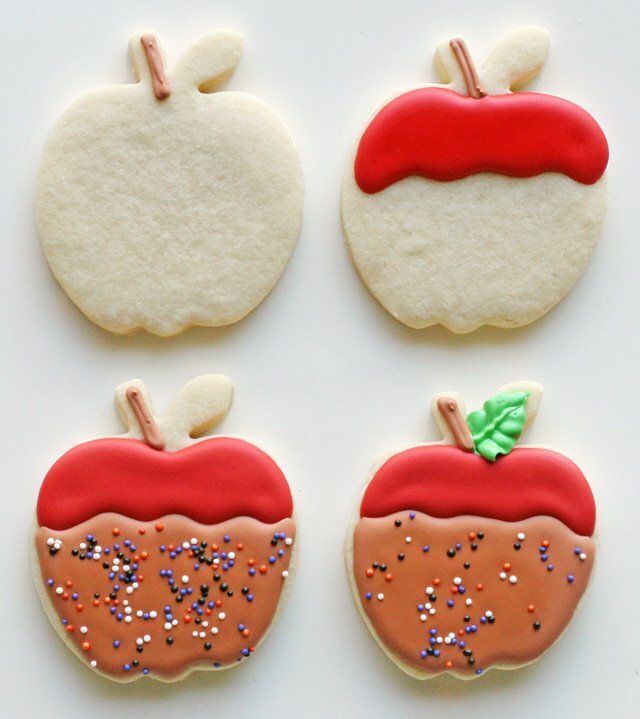 Add the apple stem either before or after the rest of the cookie is decorated. 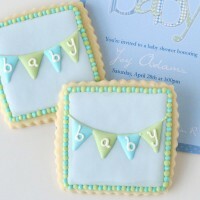 Optional- Certainly this cookie design would look cute with a wooden popsicle stick added. 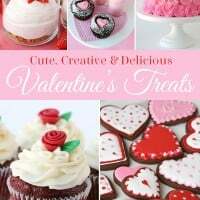 You can add the stick to the cookies before baking (insert into the dough), or simply “glue” the stick on the backs of the finished cookies with a bit of royal icing. 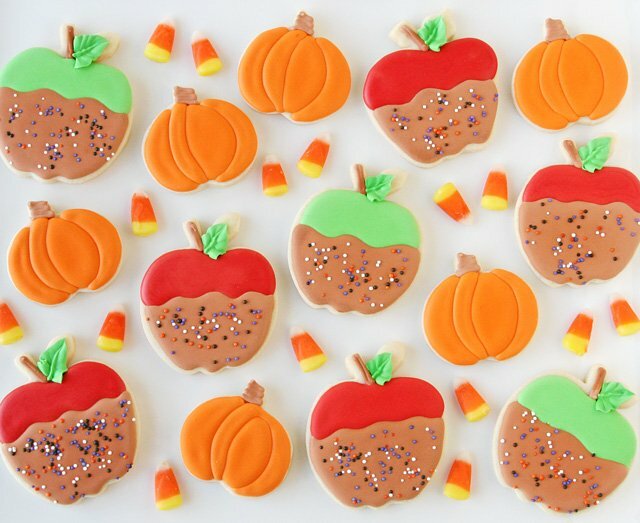 Here are the fun caramel apple decorated cookies, along with some simple pumpkins. If you follow me on Instagram (and you totally should!) you’ll recognize these as the cookies I took to a party this weekend. These are SO gorgeous Glory! I want to eat one. These are so dang cute! Love them! I love your caramel apples! They are so cute! 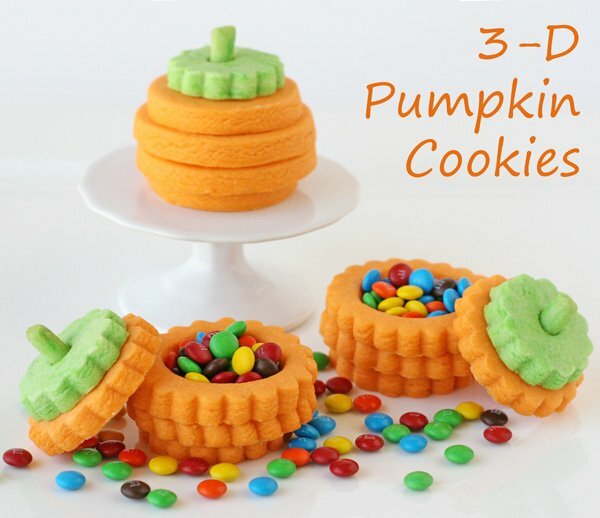 I think your 3D pumpkins are still some of my favorite pumpkin cookies ever. They look absolutely awesome! Happy cookies! 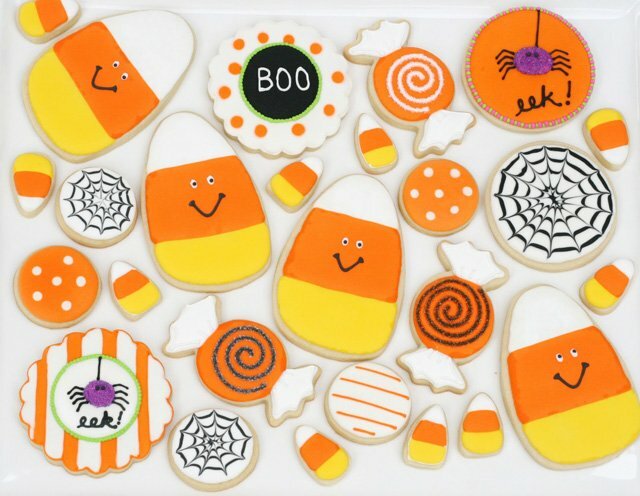 I love this entire collection of Halloween cookies. Your caramel apple cookies are great and a lot easier to eat than a real caramel apple! Your decorating is so perfect it looks like it was done by a precise machine. Amazing!!! Oh my – sooooooooooo cute!!! So creative, and I love how you did the apple leaves. Bravo! Love these! 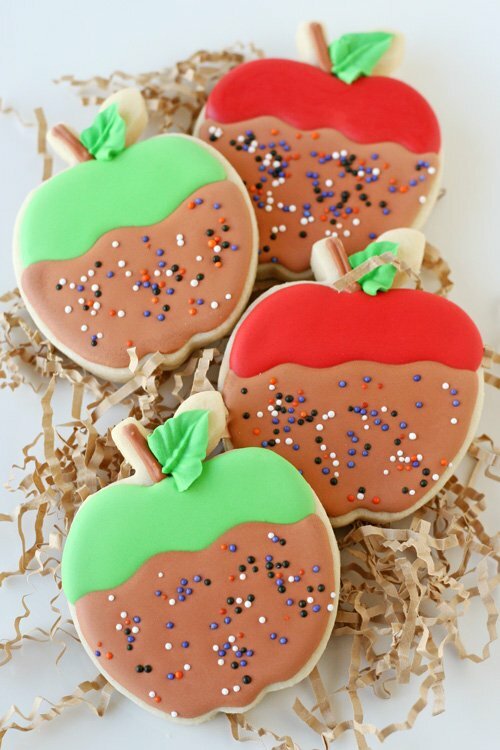 I just tried making my first caramel apple cookies a few weeks ago but yours are way cuter! Can never seem to get my icing to look so perfect. Thanks for the sweet comment Ashley! I absolutely love your cookies, they are so cute. I was wondering though, how does the royal frosting taste? I love the look the frosting gives to the cookies but I also want something that will taste good. Thanks. I think royal icing tastes good, but I guess it’s just a matter of preference. I don’t think it tastes as good as chocolate frosting… but it can decorate cookies in a way that almost no other frosting can. Royal icing mostly just tastes like sugar (once it’s dry). If you make sure the cookies under the icing are yummy, then that will help too! Be sure to use good quality vanilla, or other flavorings if you desire. Give it a try and feel free to experiment a bit. So cute and creative! 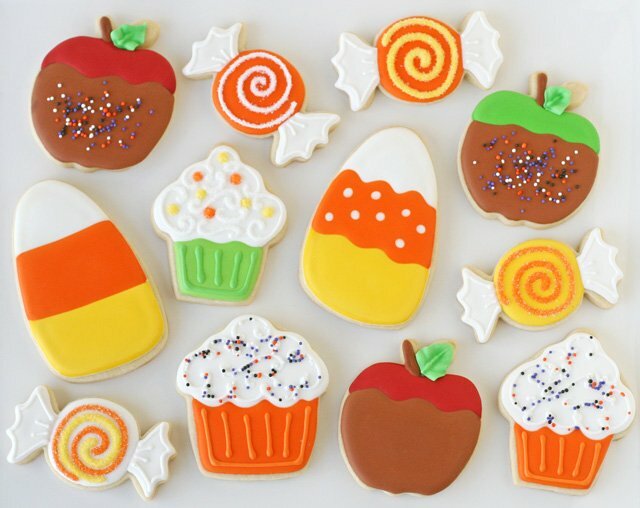 I love seeing how differently everyone decorates their cookies. Yours look perfect! It doesn’t even look real…o.0 phenomenal. Hello. I love everything you make! But how do you get that spectaticular caramel color? New to your blog and BLOWN AWAY! I just added to your page to my Chrome bookmarks. 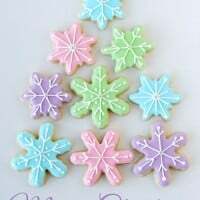 I love to frost sugar cookies (not nearly as well as you do), and I will be back to your site often! This is seriously the best comment! Thanks so much! So glad you found me!